The following pictures show the T028 on a theatre stage in Rotterdam Luxor Theatre. 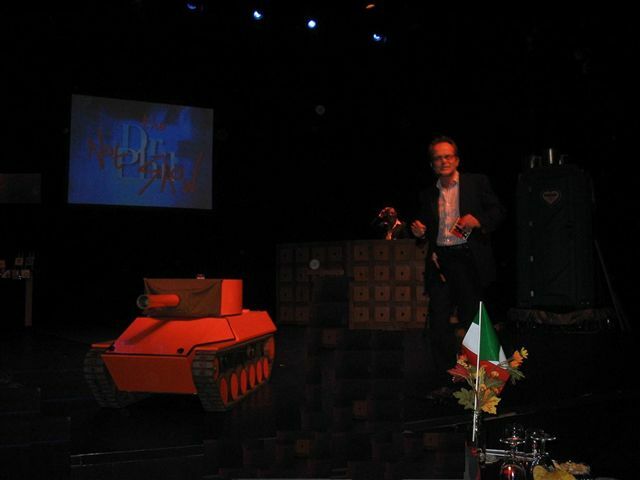 A Dutch theatre producer (man climbing out of turret) was looking for a mini tank for an opening sketch in his play and found my website. We made a deal: he can use the tank in all 13 shows throughout The Netherlands (Amsterdam, Rotterdam, Delft, etc.) and I was given a small part in the play. Why is the tank painted orange, you ask? Well, it isn't. It needed to be orange colored (orange is the Dutch national color) and since I didn't feel like painting it they provided self adhesive plastic sheeting to completely transform the tank into an orange war machine. Not looking too bad, I guess. 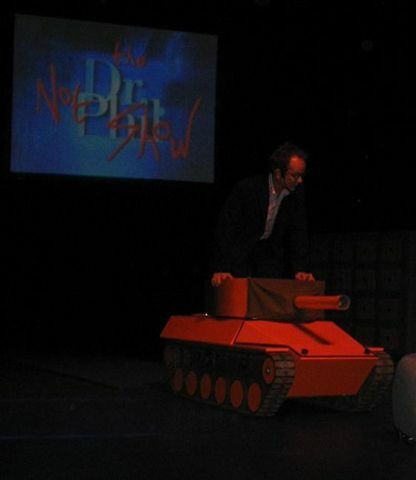 The play is called Not the Dr. Phil Show and is a mix of sick comedy, a talkshow with Dutch celebs, music and an orange mini tank. There is a show in a major city each month until May 2007. It's really fun to cooperate and people are always very interested in the small tank.